Fact -- Chromebooks are much better than Windows 10 PCs. Well, for some people, at least. I'll concede that some consumers will be better served by Windows or macOS, but nowadays, most home users can get by with Chrome OS. After all, many folks live in the web browser, doing things like watching YouTube and checking Facebook. While Windows 10 can arguably do more, it is also less secure. If you can get by with a Chromebook, you should! By the way, Chrome OS is not a glorified web browser, but instead, a well-designed Linux-based operating system. Today, Google unveils the "Pixelbook," which is a high-end Chromebook with a 12.3-inch touch screen and stylus support. It can even convert into a tablet. It weighs a mere 1.1 kilograms and is just 10.3mm thick. Since it can run Android apps, there isn't much you can't do with it. True, it isn't a solution for, say, professional photo or video editing, but most people don't need that. And so, the Pixelbook is here to offer an elegant Chrome OS experience, reminiscent of the excellent Chromebook Pixel. "Pixelbook starts up in seconds, stays fast throughout the day, and won’t slow down over time. Chrome OS provides a more secure computing experience, with multiple layers of security and automatic updates. 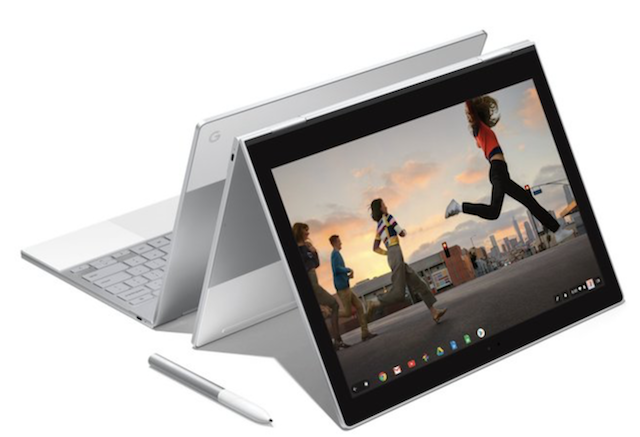 Pixelbook uses Intel Core i5 and i7 processors and plenty of RAM to smoothly handle your multitasking needs," says Matt Vokoun, Hardware Product Management, Google. Vokoun further says, "With storage options up to 512 GB, you can store documents, movies, music and apps, and Google Drive will sync your most recent Google Docs, Sheets and Slides to your device, so you can keep working and watching even when you’re offline. Pixelbook’s battery lasts up to 10 hours and if you run low on juice, 15 minutes of charging gets you up to two hours. You can also use your Pixelbook charger with your Pixel phone, giving you one less thing to carry around." So how much will Google Pixelbook cost? The elegant Chromebook starts at just $999. The Pixelbook Pen costs $99, which seems a bit expensive. With that said, it is more than your average stylus -- it features an impressive 2,000 levels of pressure. The base model gets you an Intel Core i5 processor, 8GB of RAM, and 128GB of onboard storage. For $200 more, you can upgrade to a 256GB SSD. The search giant will eventually sell a Core i7 variant with double the RAM and 512GB of storage for $1,649. For now, only the Core i5 models are available for pre-order. You can reserve your Pixelbook here now. Do you agree that a Chromebook is a better choice than a Windows 10 PC for most home consumers nowadays? Tell me in the comments below.